@JackPhan / TwitterThe stunts this taekwondo pull off will be the best sports highlights you see all day. A taekwondo team has gone viral after a video of their unreal performance made the rounds on social media. The clips came from the Kukkiwon Demonstration Team, who were performing at the opening ceremony of the World Taekwondo Hanmadang. The performance features numerous unbelievable high-flying feats and more broken boards than you can count. With football still two weeks away, sports fans are truly in the dog days of summer. Baseball has been around long enough to be familiar but is still a few weeks away from the crucial September games, and basketball free agency has long been silent. 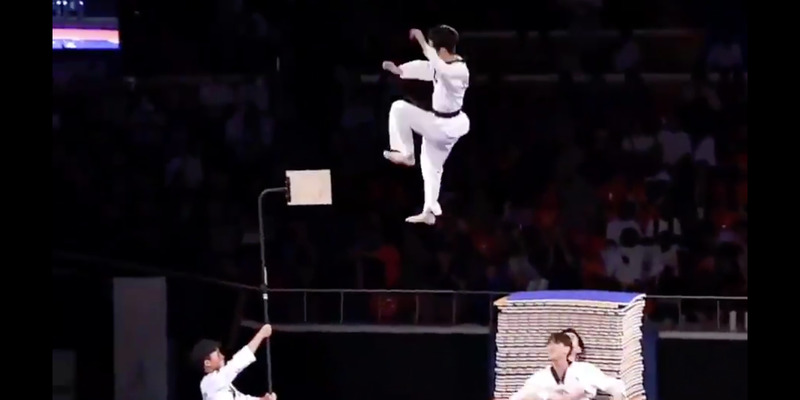 Thankfully, while traditional sports might not provide the highlights you crave, taekwondo season is apparently in full swing and has some impressive footage that has to be seen to be believed. At the opening ceremony of the World Taekwondo Hanmadang, an annual festival celebrating the martial art, the Kukkiwon Demonstration Team put on an unbelievable show that features huge kicks, athletes thrown high into the air, and too many broken boards to count. You can check out some of the highlights from their performance below.